Saxe-Hildburghausen was one of the Ernestine duchies of the House of Wettin. 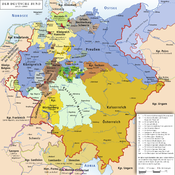 Although it was very small, Saxe-Hildburghausen was an independent duchy from 1680 to 1826. In 1684 the duchy changed its capital from Heldburg to Hildburghausen, and changed its name to Saxe-Hildburghausen. In 1810, a Princess Therese of Saxe-Hildburghausen married Crown Prince Ludwig of Bavaria, who became king of Bavaria 15 years later. The marriage is the reason for the Oktoberfest, held annually in Munich. In 1868, four districts were established in the duchy of Saxe-Meiningen. 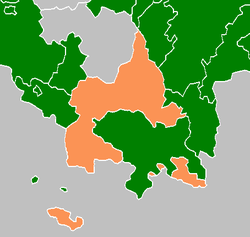 Hildburghausen was one of these districts, with boundaries very similar to those of the former duchy. It remained almost unchanged until 1993, when the former district of Suhl was dissolved and most of its municipalities joined the district. This page was last changed on 28 June 2017, at 12:55.